A couple touchdown passes from Brian Hoyer to Marquise Goodwin and Carlos Hyde had the 49ers up 14-0 at the end of the first half. Two Case Keenum touchdown passes to Rodney Adams and Kyle Carter and a Jerick McKinnon kick-return touchdown seemed to make the Vikings competitive, but it took a Taylor Heinicke 2-point conversion run as time expired for the Vikings to beat the 49ers 32-31. With that, we give you our PFF exclusive takeaways from the contest for each team. Bradford completed 17 of 20 passes, and two of his incompletions were drops by Stefan Diggs. He was a perfect 14-for-14 on throws shorter than 10 yards through the air, and his three completions beyond 10 went for 61 of his 134 yards passing. Keenum led the Vikings on two touchdown drives in the second half, built largely on his play under pressure. When faced with San Fran’s rush, he completed four of six passes for 60 yards and one of his scores, and had an impressive passer rating of 138.9. Hunter showed why he is one of the main catalysts for the exciting Vikings defense with his pass rushing skills. In the first half he recorded two pressures rushing the passer off of the left side. Hunter was the best Viking defender among the starters and finished the game with a 83.9 pass rushing grade. Price made one of the plays of the game when he drove on a short dig route and dislodged it from Louis Murphy’s arms. The ball went straight up in the air into the waiting arms of Antone Exum Jr, and gave the Vikings excellent field position early in the 3rd quarter. Price did not allow a reception all night on 14 snaps in coverage. Battling for a roster spot, Raheen Mostert certainly gave a good impression in the second half of the 49ers third preseason game. Mostert’s highlight of the night was taking a screen for an 87 yard touchdown on 3rd & 22 to put the 49ers up two touchdowns late in the third quarter. Mostert was also impressive rushing the ball, forcing two missed tackles on only four carries with 22 of his 26 yards coming after contact. Garcon and starting quarterback Brian Hoyer appeared to be on the same page early in the game. Garcon displayed his good route running skills, beating both Viking starting corners for first downs. Garcon caught all six of his targets for 64 yards. When Garcon was targeted, Brian Hoyer’s passer rating was 111.1. 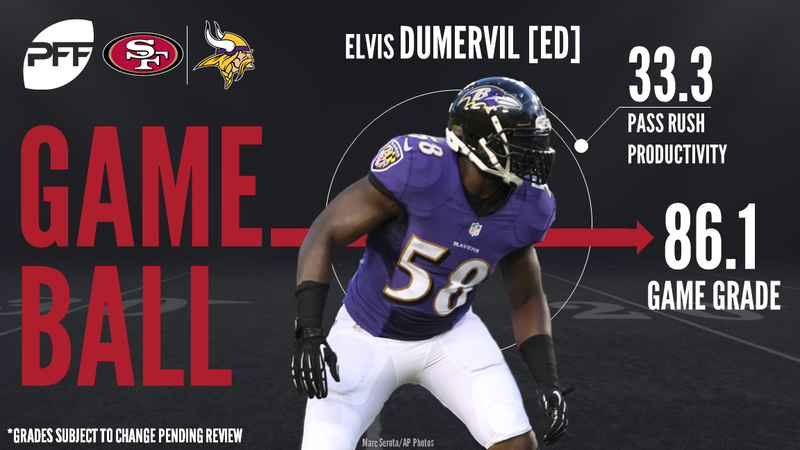 Dumervil played just 14 snaps, with 13 of them coming on the rush. However, he was nearly unstoppable off the edge, as he racked up a sack and four pressures. His pass-rush productivity score of 33.3 was third-best among 4-3 defensive ends this week. Not to be outdone by his teammate, Lynch posted a week-high eight total pressures on 19 pass-rushes. He did all of his damage off the left side, most of it coming against Minnesota’s second-year tackle Willie Beavers (one hit and five pressures against).